I have decided to wind down my investment test with LendingClub. I should end up with a investment return of about 5% annually. So it beat just leaving the money in the bank. But returns are eroding more recently and the risk does not seem worth the returns. Early on I was a bit worried by how often the loan defaulted with only 0, 1 or 2 payments made. Sure, there are going to be some defaults and sometimes in extremely unlucky situation it might happen right away. But the amount of them seems to me to indicate LendingClub fails to do an adequate job of screening loan candidates. Over time the rates LendingClub quoted for returns declined. The charges to investors for collecting on late loans were very high. It was common to see charges 9 to 10 times higher as the investor than were charged to the person that took out the loan and made the late payment. For the last 6 months my account balance has essentially stayed the same (bouncing within the same range of value). I stopped reinvesting the payments received from LendingClub loans several months ago and have begun withdrawing the funds back to my account. I will likely just leave the funds in cash to increase my reserves given the lack of appealing investment options (and also a desire to increase my cash position in given my personal finances now and looking forward for the next year). I may invest the funds in dividend stocks depending on what happens. 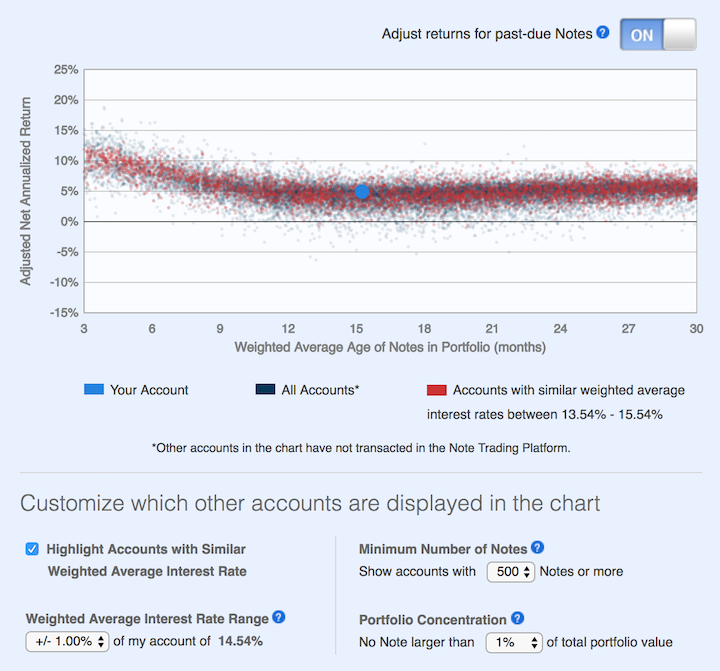 This chart shows lending club returns for portfolios similar to mine. As you can see a return of about 5% is common (which is about where I am). Quite a few more than before actually have negative returns. When I started, my recollection is that their results showed no losses for well diversified portfolios. The two problems I see are poor underwriting quality and high costs that eat into returns. I do believe the peer to peer lending model has potential as a way to diversify investments. I think it can offer decent rates and provide some balance that would normally be in the bond portion of a portfolio allocation. I am just not sold on LendingClub’s execution for delivering on that potential good investment option. At this time I don’t see another peer to peer lending options worth exploring. I will be willing to reconsider these types of investments at a later time. I plan to just withdraw money as payments on made on the loans I participated in through LendingClub. This chart shows that the percentage of millionaire families by highest education level is dramatically different by education level. The data is looking at USA family income for household headed by a person over 40. 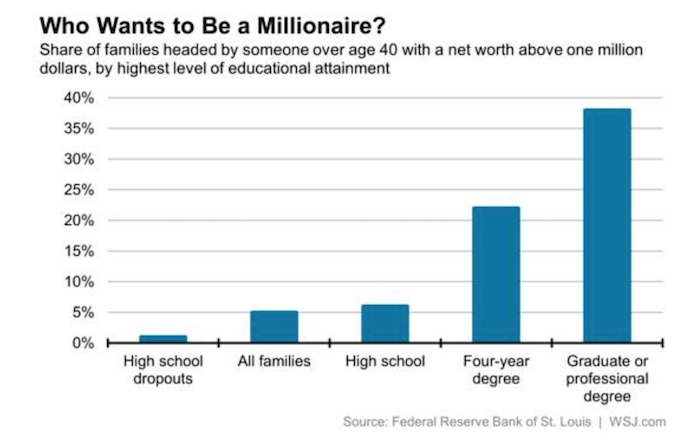 For high school dropouts, fewer than 1% are millionaires; all families it is about 5%; high school graduates about 6%; 4 year college degree about 22% and graduate or professional degree about 38%. While the costs of higher education in the USA have become crazy the evidence still suggests education is highly correlated to income. Numerous studies still show that the investment in education pays a high return. Of course, simple correlation isn’t sufficient to make that judgement but in other studies they have attempted to use more accurate measures of the value of education to life long earnings. The blog post with the chart, Why Wealth Inequality Is Way More Complicated Than Just Rich and Poor has other very interesting data. Go read the full post. Average isn’t a very good measure for economic wealth data, is is skewed horribly by the extremely wealthy, median isn’t a perfect measure but it is much better. The post includes a chart of average wealth by age which is interesting though I think the $ amounts are largely worthless (due to average being so pointless). The interesting point is there is a pretty straight line climb to a maximum at 62 and then a decline that is about as rapid as the climb in wealth. That decline is slow for a bit, dropping, but slowly until about 70 when it drops fairly quickly. It isn’t an amazing result but still interesting. It would be nice to see this with median levels and then averaged over a 20 year period. The chart they show tells the results for some point in time (it isn’t indicated) but doesn’t give you an idea if this is a consistent result over time or something special about the measurement at the time. They also do have a chart showing absolute wealth data as median and average to show how distorted an average is. For example, median wealth for whites 55-64 and above 65 is about $280,000 and the average for both is about $1,000,000. The Center for Retirement Research at Boston College is a tremendous resource for those planning for, or in, retirement. The center created the National Retirement Risk Index (NRRI) to capture a macroeconomic level measure of how those in the USA are progressing toward retirement. Based on the Federal Reserve’s 2013 Survey of Consumer Finances the Center updated the NRRI results (the entire article is a very good read). The NRRI shows that, as of 2013, more than half of today’s households will not have enough retirement income to maintain their pre-retirement standard of living, even if they work to age 65 – which is above the current average retirement age – and annuitize all their financial assets, including the receipts from a reverse mortgage on their homes. The NRRI clearly indicates that many Americans need to save more and/or work longer. 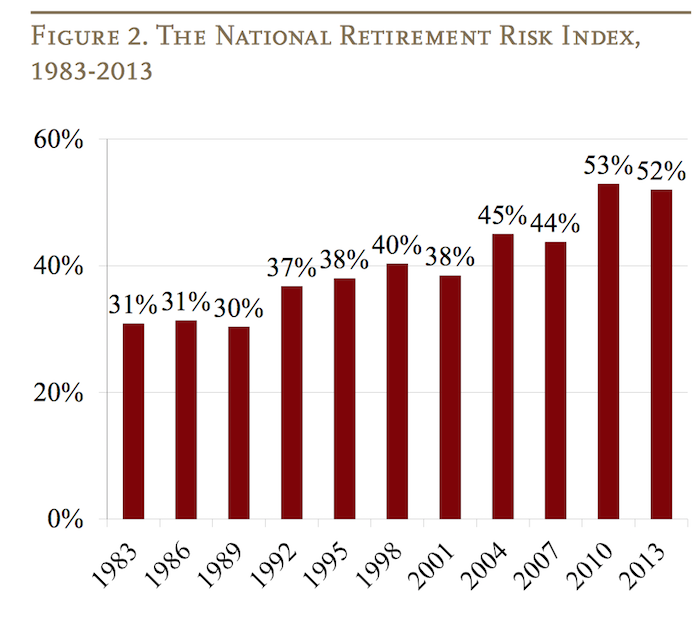 The lower the risk number in the chart the better, so things have not been going well since the 1990s for those in the USA saving for retirement. As the report discusses their are significant issues with retirement planning that defy easy prediction; this makes things even more challenging for those saving for retirement. The report discusses the difficulty placed on retirees by the Fed’s extremely low interest rate policy (a policy that provides billions each year to too-big-too-fail banks – hardly the reward that should be provided for bringing the world to economic calamity but never-the-less that transfer of wealth from retirees to too-big-to-fail banks is the policy the Fed has chosen). That exacerbates the problems of too little savings during the working career for those in the USA. The continued evidence is that those in the USA continue to spend too much today and save too little. Also you have to expect the Fed and politicians will continue to make policy that favors their friends at too-big-fail banks and hedge funds and the like. You can’t expect them to behave differently than they have been the last 50 years. That means the likely actions by the government to take from median income people to aid the richest 1% (such as bailing out the bankers with super low interest rate policies and continue to subsidize losses and privatize their winning bets) will continue. You need to have extra savings to support those policies. Of course we could change to do things differently but there is no realistic evidence of any move to do so. Retirement planning needs to be based on evidence, not hopes about how things should be. Each of those asset buckets protects against a different type of risk. And that is a very sensible approach to investing in the year ahead. Cash will protect you against a market collapse in anything (provided it’s cash held with a solid institution). Government bonds protect against deflation (provided your money’s invested in solid government bonds and not trash). Equities offer capital growth and income. And gold, as we know, protects against currency depreciation, inflation, and financial collapse. It’s vitally important to maintain holdings in each, in my opinion. The beauty of a ‘static’ allocation across these four asset classes is that it removes emotion from the investment process. I don’t really agree with this but I think it is an interesting read. And I do agree the standard stock/bond/cash portfolio model is not good enough. I would rather own real estate than gold. I doubt I would ever have more than 5% gold and only would suggest that if someone was really rich (so had money to put everywhere). Even then I imagine I would balance it with investments in other commodities. One of the many problems with “stock” allocations is that doesn’t tell you enough. I think global exposure is wise (to some extent S&P 500 does this as many of those companies have huge international exposure – still I would go beyond that). Also I would be willing to take some stock in commodities type companies (oil and gas, mining, real estate, forests…) as a different bucket than “stocks” even though they are stocks. And given the super low interest rates I see dividend paying stocks as an alternative to bonds. The Cockroach Portfolio does suggest only government bonds (and is meant for the USA where those bonds are fairly sensible I think) but in the age of the internet many of my readers are global. It may well not make sense to have a huge portion of your portfolio in many countries bonds. And outside the USA I wouldn’t have such a large portion in USA bonds. And they don’t address the average maturity (at least in this article) – I would avoid longer maturities given the super low rates now. If rates were higher I would get some long term bonds. These adjustments mean I don’t have as simple a suggestion as the cockroach portfolio. But I think that is sensible. There is no one portfolio that makes sense. What portfolio is wise depends on many things. There are many asset allocation strategies; which often are pretty similar. In general they oversimplify the situation (so an investor needs to study and adjust them to their situation – though most don’t do this, which is a problem). 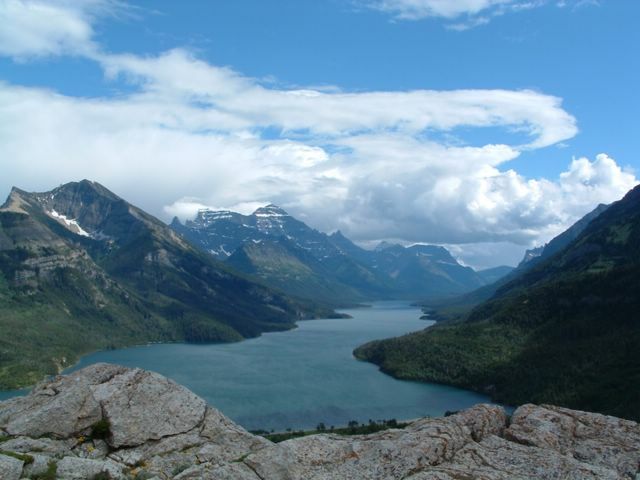 In general, I think asset allocation suggestions are too heavily weighted on bonds, and that is even more true today in the current environment – of could that is just my opinion. I ran across this suggested allocation in Eyewitness to a Wall Street mugging which I think has several good values. In my opinion this allocation should be adjusted as you get closer to retirement (put a bit more into more stable, income producing investments). My personal preference is to use high quality dividend stocks in the current interest rate environment. I would buy them myself which does require a bit more work than once a year rebalancing that the lazy golfer portfolio allows. I would also include 10% for Vanguard emerging markets fund (VWO) (for sake of a rule of thumb reduce Inflation Protected Securities Fund to 10% if you are more than 10 years from retirement, when between 10 and 1 year from retirement put Inflation Protected Securities Fund at 15% and Total Stock Market Index Fund at 35%, when 1 year from retirement or retired lower emerging market to 5% and put 5% in money market. Depending on your other assets this portfolio should be adjusted (large real estate holdings [large net value on personal home, investment real estate…] can mean less real estate in this portfolio, 401k holdings may mean you want to tweak this [TIAA CREF has a very good real estate fund, if you have access to it you might make real estate a high value in your 401k and then adjust your lazy portfolio], large pension means you can lower income producing assets, how close you are to retirement, etc. ).